Here's to Refreshing Summer Drinks! Heavenly Spirits will be sampling a wide selection of our exceptional spirits and refreshing summer cocktails at one of our favorite Cape Cod retailers, including: Armagnac, Absinthe, Qino One Vodka, Pastis and Rum. Open to the adult public, please come by for a visit. See www.uncorkedonline.com for more details. 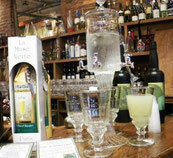 Heavenly Spirits will be participating in Cork's Friday night tasting event, along with several other suppliers. Open to the adult public, please come by for a visit. We'll be tasting many of our wonderful products, including: Armagnac, Cognac, Calvados Absinthe and Rum. See www.corksfinewine.com for more details.